As Thursday is a public holiday and it seems a shame just to have one day off and then go back to work on Friday, I have taken off both Thursday and Friday so we can have a long weekend getaway. We will take the train to Geneva and then stay there overnight, meeting up with some friends for dinner, and then the next day take a hire car and drive to Cannes. The plan is to visit Cannes, St Tropez, Nice and Monaco. Whist Anny is sleeping in the mornings, I will have a good opportunity to get up early and go for a run. As Cannes is on the coast, a spot of beach running may be on the agenda. This will be a good chance to put on a rucksack with a few weights in it, and see what running on sand with a weighted backpack feels like. I have no doubts that it will be tough. The other factor that will make the training more MDS like is that I am hoping it will be sweltering hot. 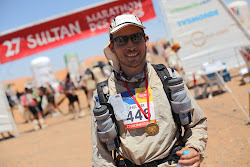 That really would help to bring all the elements together for an MDS like run. It is far too long before the event itself to get any benefit from the sand running in hot weather with a backpack, but it will be a great way to experience just a hint of what it may be like. A few of us are entered into the Alpes Maritimes Marathon, 20th Nov. 2011. Starts in Nice, ends in Cannes !! You want to join? There will be other non-running girlfriends/wives there, so Anny will be in great company too! !